Brahmavar, May 23, 2015: Union Minister for Law and Parliamentary Affairs DV Sadananda Gowda has said that the NDA government at the Centre has taken the right steps towards making the nation an economic power through employment generation, skill development, simplification of laws and providing transparent administration within one year of coming to power. He was speaking after inaugurating the Udupi Rural BJP office named Jagajeevandas Shetty Bhavan at the Madhuvan Complex at Brahmavar on May 22, Friday. A huge convention of party workers was also organised under the aegis of the Backward Classes Cell of the party. Gowda claimed that the government has succeeded in bringing about financial discipline through various measures. He was critical of the Congress for lashing out at the PM over his foreign tours, while its very own party vice president was missing for 55 days recently. “India which was a barren land under Congress tenure has been converted into a fertile, flourishing land.” Gowda said adding the Land Acquisition Act has been framed in the best interests of the farmers. MLC Kota Srinivas Poojary delivered the key note address. 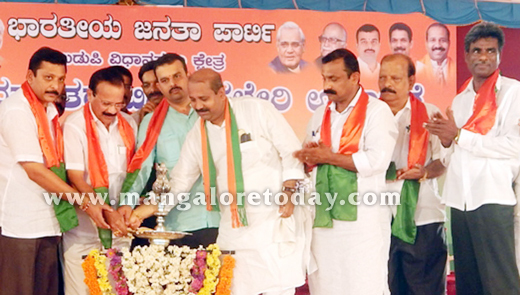 Former Udupi MLA Raghupathi Bhat, Udupi District BJP President Tingale Vikramarjun Hegde, Udupi Rural BJP President Balakrishna Shetty Karje, MLC Capt Ganesh Karnik, former MLA Lalaji Mendon and several party leaders were present.